Cannabis consumers’ unexpectedly strong appetite for edible products has manufacturers scrambling to expand facilities and meet demand. Sales of marijuana-infused food and beverages since Jan. 1 have exceeded most industry projections. Many retail shops sold out of their edibles inventory on the first day of legal sales or soon after, and manufacturers since have been trying to ramp up production. Colorado’s largest maker of infused products, Dixie Elixirs, recently moved to a new industrial building in Montbello with four times as much space as its former facility in Stapleton. Another major firm, Medically Correct, is in the process of moving from a cramped 1,200-square-foot kitchen in the Platte Valley to a nearby building with 8,000 square feet — including production facilities for its Incredibles-branded chocolate bars as well as space, for the first time, to grow its own marijuana. If surging consumer demand weren’t enough of a challenge, edibles companies are faced with retooling their production equipment and packaging to conform with new state regulations that take effect Nov. 1. The draft rules require infused products to be sold in individual servings containing no more than 10 milligrams of THC — the psychoactive agent in cannabis — or in higher-dosage packages easily dividable into 10 milligram servings. In another change, manufacturers must put single-serving edibles in child-resistant packaging before shipping them to stores, instead of relying on retailers to provide the packaging when purchases are made. Manufacturers say compliance with the regulations could slow production and once again create a supply-demand imbalance, just as they were getting inventories back to normal levels. The Colorado Department of Revenue tracks overall cannabis sales but does not break them down between edibles and smokeable products. Jamie Perino, co-owner of the Euflora pot shop on the 16th Street Mall, said her sales are roughly 50/50 between infused and smokeable lines — a much higher proportion of infused sales than anticipated when the store opened in April. “A lot of people tell me that they’ve smoked weed before (legalization), so now they’re looking for something new and different,” she said. Perino said it’s a challenge to maintain full inventories of edibles. The shop serves more out-of-state tourists than typical stores because of its mall location, which may partly explain why edibles are popular there. Retailers say visitors lean toward infused products because laws against public smoking leave them with fewer locations to smoke than residents with private homes. Cannabis purchases by out-of-state visitors account for an estimated 44 percent of all retail sales in the Denver area and about 90 percent in mountain resorts, according to a recent market study commissioned by the Colorado Marijuana Enforcement Division. 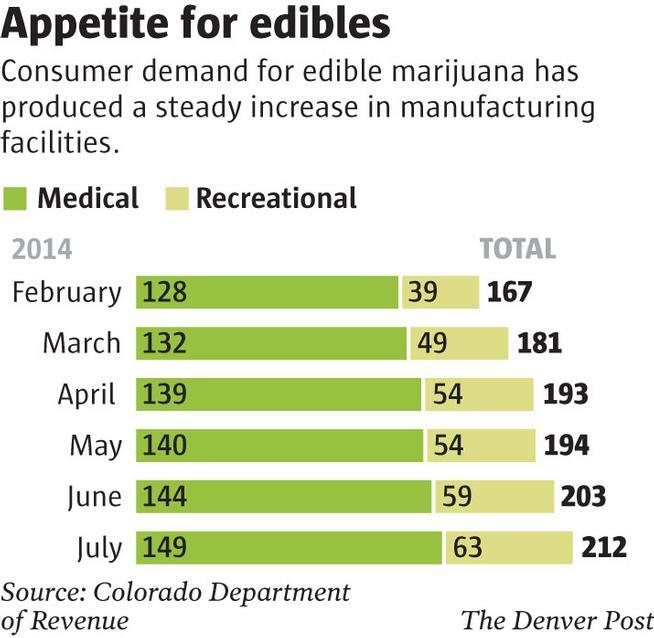 Graphic: Colorado demand for marijuana is estimated at 130 metric tons of pot for 2014 — how heavy is that? Most manufacturers of edibles produce THC by extracting it from the trimmings left when marijuana flower buds are groomed. Yet trim was in short supply earlier this year because retailers — unsure of how high demand would soar after recreational legalization — were using it for pre-rolled joints instead of selling it to manufacturers. 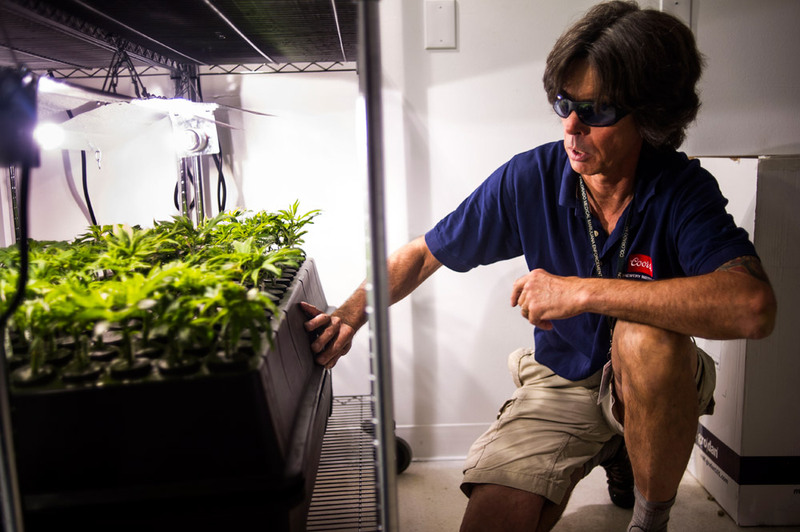 Now, makers of infused products increasingly are growing their own in order to circumvent supply disruptions. Dixie Elixirs is dedicating almost half of its new, 47,000-square-foot facility for cultivation. The firm has spent $5 million in cash — bank loans typically are unavailable to marijuana businesses — on the purchase and renovation of the building. As more manufacturers look to expand or relocate to larger facilities, industrial space is at a premium, said Jason Thomas of Avalon Realty Advisors, a Denver firm that specializes in the marijuana industry. Denver warehouse space was virtually unavailable earlier this year amid competition from pot growers. But in potential good news for manufacturers, Thomas said the speculation-fueled shortage is easing and more options may open up with Aurora’s scheduled start of legal retail marijuana on Oct. 1. Authorizing sales also will allow industrial-scale cannabis cultivation.